About 3 months ago, I talked about Digital Swish of Skirt on this blog. As I mentioned in the previous blog, the swish of skirt means that mothers are getting overly involved in the schooling for their children, especially during 1980s in Korea. Due to the increase of using smartphones among mothers (ajummas), they are now getting involved in the schooling for their children through using their smartphones. The use of smartphones brought a variety of advantages to our daily lives, this is so true. However, everything is a double-edged sword. Digital swish of skirt actually let mothers (ajummas) get involved in the schooling for their children easily. Through using various apps that are relevant to their children’s education, these mothers (ajummas) are able to control or help their children’s education systematically. They could share useful and voluminous information with each other instantaneously and directly.Without visiting every private educational institutes, these mothers (ajummas) can get information for their children’s educational needs. Besides, they are able to hear living opinions from other mothers who are in the same boat. However, this SNS or Digital swish of skirt also have problems although there are a variety of advantages of doing Digital (or SNS) swish of skirt among mothers (ajummas). I don’t mean that these mothers are people who cause problems at all. They are too passionate about their children’s education (all of mothers are in the world) and the use of social media encourages them to get more involved into having the swish of skirt for their children because they are mothers and ajummas who love their children the most. This Digital (SNS) swish of skirt tired teachers out. Mothers (ajummas) left comments or questions about schooling on teachers’ Instagram accounts. And you also know that, the advantages of using social media (well, it sometimes could be ‘disadvantages’) is ‘you can be always on’ and ‘you can contact someone instantaneously through using your smartphones’ without having barriers of time and space. YES, YOU CAN! So, teachers are actually working for their students and parents for 24 hours a day and 7 days a week, like a convenience store. Of course they don’t have to answer or react to every single comment or question of mothers that are left on Instagrams, but you know…it is a delicate situation for teachers I reckon. Of course I don’t mean that I don’t understand these mothers (ajummas). I fully understand how these mothers are passionate about their children’s education and what they want to do for their children. However, I think that we should concern about the use of social media on our smartphones more carefully. The one of biggest advantage of using smartphones is that it allows us to have instantaneous mobile communication but it doesn’t mean that ‘you can get answers from her (or him) whenever you ask’. Especially, the teachers are working in the school for working hours and after hours are their own time to enjoy themselves. 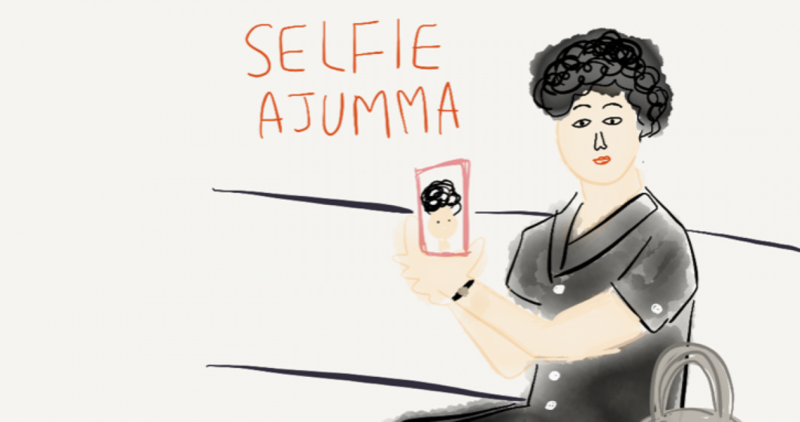 At the same time, social media such as Instagram is a personal space where people share their personal stuff with others, so I think mothers (ajummas) should respect the privacy of teachers in Instagram. If mothers (ajummas) have any questions about their children, they should use other ways to contact to teachers rather than leaving comments on photos of Instagram. Also, I expect that a useful and helpful social media should be developed that satisfy both mothers (ajummas) and teachers. This social media will help mothers keep continuing Digital swish of skirt for their children and at the same time this Digital swish of skirt won’t disrupt teachers’ privacy and their own free time after working hours. I think Digital swish of skirt or swish of skirt is a desirable thing if there is a good balance between mothers’ passion about their children’s education and mothers’ concern about teachers’ privacy in their private social media spaces. So it is all about passion and concern I think.